Home > Heavy Duty V Belts > Poly-V Ribbed (Micro -V) Belts > J, PJ Section Poly-V (Micro V) Belts - 3/32" Rib Width. > 260J7 Poly-V Belt. Metric 7-PJ660 Drive Belt. > 260J10 Poly-V Belt, Industrial Grade. Metric belt 10PJ660. 260J10 Poly-V Belt. Industrial Grade. 26" (660mm) Length, 10 rib motor belt (15/16" Wide). Metric belt 10PJ660. Star Trac Drive Belt 130-0120 for 2000\3000\1200\1600\1500\1000 Models. Pacemaster ProPlus Auto Treadmill Drive Belt 260-J10. Clarke/American Sanders part 56459447 (260J10). Landice treadmills: 8700 Sprint-VFX, SST-VFX, and PRG_VFX ; L-60 Series - L-9 Club Treadmill ; L7 Commercial Executive, Cardio, Pro, and Sport Trainers ; L8 Commercial Executive, Cardio, Pro, and Sport Trainers. 260J8 Poly-V Belt. 26� Length. PJ660/260J 8-rib Motor Belt replaces fitness belts, compressor belts, power tool drive belts, and electric motor belts. 260J-8 Micro-V Belt. 260J16 Belt (16-PJ660). 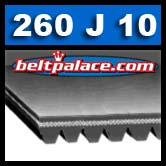 260J-16 Poly-V (Micro-V) Belts: 26� OC Length: J Section Motor Belt replaces fitness belts, compressor belts, drive belts, and electric motor belts. 260J-16 Poly-V Belt.